WILLIAMSBURG — Mount Union had 10 hitters drive in a run as it defeated Williamsburg, 24-5, in Inter-County Conference baseball Tuesday afternoon. Klayton Willoughby and Dylan Gearhart led the Trojans’ charge. Willoughby went 2-for-3 with a grand slam while Gearhart went 3-for-4 with a home run and five RBIs. Mount Union (7-0, 6-0) hosts Moshannon Valley Thursday. WP: Seth Smith. LP: Drew Hileman. SO: Smith 2 (MU); Dillion Hartman, Riley Parks (W). BB: Smith, Grayson McClain (MU); Hileman 3, Hartman, Parks 2 (W). HR: Dylan Gearhart, Kobe Hand, Klayton Willoughby (MU). 2B: Matt Harshbarger, Cael Walter, Hand, Smith (MU); Hileman (W). MH: McClain 2-3, Gearhart 3-4, Hand 3-4, Quinnten Fultz 3-4, Ethan Carbaugh 2-3, Willoughby 2-3 (MU); Ben Post 2-3 (W). RBIs: Vince Lear, Harshbarger, Blake Woodward, Gearhart 5, Quinton Posey, Walter, Hand 4, Colten Benson, Fultz, Smith 2, Willoughby 4 (MU); Josiah Dowey 2, Lamber Palmer 2, Shane Brentner. 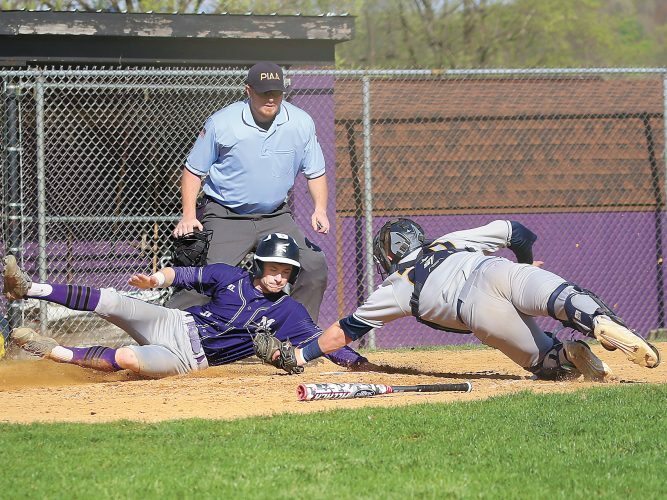 MILLERSTOWN — The Greenwood bats were too much for East Juniata to handle as the Wildcats defeated the Tigers in five innings by a 14-2 score in a Tri-Valley League baseball game Tuesday. The Wildcats had five different players with multiple hits; Aaron Morder and Aaron Bollinger went 3-for-4 at the plate. Bollinger also was on the mound for Greenwood, pitching three innings with six strikeouts and three walks before handing the ball over to Austin Murphy who had scored a strikeout. For the Tigers, Cy Fronk and Kobe Bonell were the only multiple hitters while Daniel Kanagy went 1-for-2 driving in the lone East Juniata run with a double. Greenwood hosts Juniata while East Juniata hosts Susquenita on Thursday. WP: Aaron Bollinger. LP: Nathaniel Losch. SO: Bollinger 6, Austin Murphy (G). BB: Bollinger 3 (G); Losch 2 (EJ). HR: Bryce Dalpiaz (G). 3B: Aaron Morder (G). 2B: Bollinger (G); Daniel Kanagy (EJ). MH: Aaron Morder 3-4, Bollinger 3-4, Dalpiaz 2-2, Garrett Howell 2-4, Ethan Jetewski 2-3, Ricky Taylor 2-3 (G); Cy Fronk 2-3, Kobe Bonell 2-2 (EJ). RBI: Aa. Morder 3, Bollinger 5, Dalpiaz 3, Howell (G); Kanagy (EJ). MIFFLINTOWN — Juniata’s three-run lead after an inning evaporated in the second as Millersburg took advantage of mistakes by the Indians with a five-run frame that fueled a 9-5 victory in Tri-Valley League baseball Tuesday. Juniata pitchers issued four walks but, more crucial, the field committed six errors. Nealman had all four of Juniata’s strikeouts and walked just one. He was 2-for-3 at the plate with a double. WP: Conner Zimmerman. LP: Josh Bomberger. SO: Zimmerman 3, Novinger 1 (M); Devon Nealman 4 (J). BB: Zimmerman 1, Novinger 1 (M); Bomberger 3, Nealman 1 (J). 2B: Shultz (M); Nealman (J). MH: Novinger 2-5, Troutman 2-4 (M); Nealman 2-3, C.J. Bonson 2-4, Jace White 2-4. RBI: Shultz. Novinger 2, Zimmerman, Gray (M); Bonson, White, Nathan Berry (J). MOUNT UNION — It came down to who could capitalize on the other’s mistakes first and Williamsburg took advantage as Mount Union fell to the Blue Pirates 10-7 in an Inter-County Conference softball game Tuesday. There were nine total errors in the game with the Trojans having five while Williamsburg committed four. Karrigan Woodward , McKenna Shields and Madison Boozel each had multiple hits for the Trojans. Woodward was in the circle allowing 10 runs five of which were earned, striking out six and walked one. Mount Union travels to Moshannon Valley Thursday. WP: E.Frederick. LP: Karrigan Woodward. SO: Frederick 5 (W); Woodward 6 (MU). BB: Frederick 2 (W); Woodward (MU). 2B: K. Calderwood, E. Smith (W). MH: Smith 3-4, Frederick 2-4, Calderwood 2-4, D. Kyle 2-4 (W); Woodward 2-4, McKenna Shields 2-3, Madison Boozel 2-3 (MU). RBI: Smith, Frederick, M. Webb 2, M. Harclerode 2, Calderwood 2, Kyle 2 (W); Shields, Boozel, Payton Low (MU). MILLERSBURG — Juniata saw everything unravel in the fifth inning of a 10-0 loss to Millersburg in Tri-Valley League softball Thursday night. After only trailing by two entering the frame, the Indians allowed eight runs to Millersburg which picked up three extra-base hits, including a pair of home runs. Juniata (1-4, 1-4) hosts Greenwood Thursday. WP: Kierstyn Smith. LP: Ally Misal. SO: Misal, Abby Adair (J); Smith 5 (M). BB: Misal 3 (J). HR: Hannah Dyer, Lacy Strait (M). 2B: Dyer (M). MH: Dyer 3-for-4 (M). RBIs: Dyer 2, Strait 3, Megan Paul 2, Maddie Etzweiler, Smith (M). 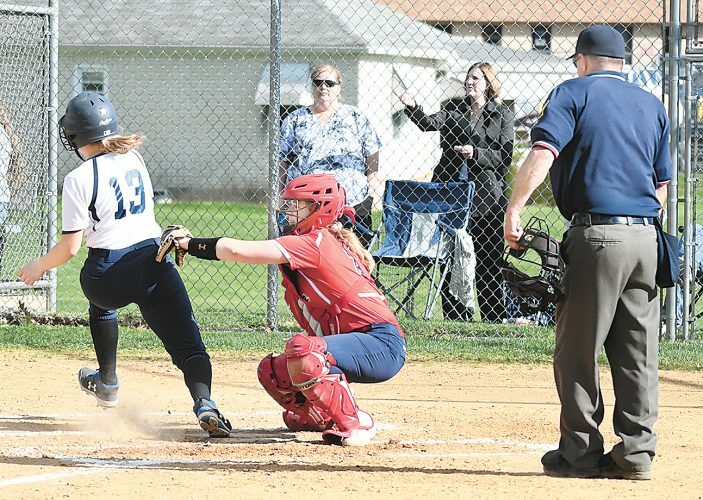 MIDDLEBURG — Raya Kunes had a decent outing in the circle and delivered a two-run homer for all of Midd-West’s runs, but a late-game drive by Bloomsburg lifted the Panthers to a 5-2 win in Heartland Conference softball Tuesday. The Mustangs’ Kaitlynn Erb had three hits in as many tries, and Marlo Spriggle added a double. WP: K.Loff. LP: Raya Kunes. SO: Loff 4 (B); Kunes 4 (M). BB: Loff 1 (B); Kunes 2 (M). HR: Kunes (M). 2B: Marlo Spriggle (M). MH: Nuss 2-4, Loff 2-3, L.Kreischer 2-4 (B); Kaitlynn Erb 3-3 (M). RBI: Klinger, Rostuchev (B); Kunes 2 (M). ELIZABETHVILLE — Greenwood spilts its meet with Upper Dauphin with the girls winning 116-34 but the boys fell 98-52 in a Tri-Valley League track and field meet Tuesday. Paityn Wirth, Amiyah Priebe, Valerie Kauffman and Abby Taylor each scored a first place finish in two different events. The Wildcats also won all of the relay races as well as sweeping the discus, long jump and pole vault events. For the boys, Greenwood was led by Nathan Barnhart, who won the javelin and triple jump, which was also where the Wildcats scored a 1-2-3 finish. Dan Campbell won the long jump, Dalton Smith placed first in the 400-meter dash and Andy Loy was victorious in the 1,600-meter run. Greenwood travels to Camp Hill Thursday. 4×800 relay: Upper Dauphin, 9:06.7. 110 hurdles: Kade Matter, UD, 19.8; Alex Schreffler, UD; Clayton Gothel, G. 100 dash: Dalton Boyer, UD, 11.8; Connor Reed, UD; Keegan Yeingst, G. 1,600 run: Andy Loy, G, 5:12.0; Collin Miller, UD; Brock Welker, UD. 400 dash: Dalton Smith, G, 58.7; Logan Manofsky, UD; Kyle Kissinger, G. 4×100 relay: Upper Dauphin, 49.2; Greenwood. 300 hurdles: Schreffler, UD, 46.1; Matter, UD; Gothel, G. 800 run: Clay Dimpsey, UD, 2:16.4; Beau Keim, UD; Brennan Miller, G. 200 dash: Boyer, UD, 25.0; Reed, UD; Yeingst, G. 3,200 run: Welker, UD, 11:46.5; Glenn Rice, G; Miller, UD. 4×400 relay: Upper Dauphin, 4:03.3; Greenwood. Javelin: Nathan Barnhart, G, 148-2; Garrett Sieber, G; Zimmerman, UD. Long jump: Dan Campbell, G, 18-10; Manofsky, UD; Dimpsey, UD. Shot put: Dane Zimmerman, UD, 42-5.5; Mitchell Kauffman, G; Ryan McGuire, UD. High jump: Josh Masser, UD, 5-8; Watts, G; Gothel, G. Triple jump: Barnhart, G, 37-6; Campbell,G; Steven Watts, G. Discus: McGuire, UD, 139-0; Zimmerman, UD; Kauffman, G. Pole vault: Gessner, UD, 11-9; Dalton Smith, G; Snyder, UD. 4×800 relay: Greenwood, 10:54.2; Upper Dauphin. 100 hurdles: Paityn Wirth, G, 17.02; Kinsey Flickinger, G; Klinger, UD. 100 dash: Sophia Shoemaker, G, 13.4; Lauren West, UD; Morgan Keim, UD. 1,600 run: Amiyah Priebe, G, 6:03.7; West, UD; Keim, UD. 400 dash: Hackenburg, UD, 1:07.14; Weger, G; Danielle Failor, G. 4×100 relay: Greenwood, 54.49; Upper Dauphin. 300 hurdles: Wirth, G, 49.05; Olivia Muffitt, G; Klinger, UD. 800 run: Lahr, UD, 2:43.05; Kierstyn Burch, G; Leah Bryner, G. 200 dash: D.Klinger, UD, 29.24; Emma Rolston, G; Shoemaker, G. 3,200 run: Priebe, G, 13:11.46; E.Peters. G; Shoemaker, G. 4×400 relay: Greenwood, 4:43.02; Upper Dauphin. Javelin: Cynthia Auxt, G, 90-4.5; Cather, UD; Kerstetter, G. Long jump: Abby Taylor, G, 15-10; Kenedy Stroup, G; Hazel Miller, G. Shot put: Valerie Kauffman, G, 47-5; Chloe Smith, G; Hall UD. High jump: Sam Schreiber, G, 4-10; Rolston, G; Fulkroad, UD. Triple jump: Taylor, G, 33-10; Fulkroad, UD; Kylie C, G. Discus: Kauffman, G, 139-3; Chloe Smith, G; Kelsey Sheaffer, G. Pole vault: Rachel Bohn, G, 8-0; Miller, G; Kim Manning, G.
MOUNT UNION — The Mount Union boys (2-5) got their first two wins of the year as the Trojans defeated Everett 90.5-59.5 and McConnellsburg 102-48 in an Inter-County Conference track and field meet Tuesday. 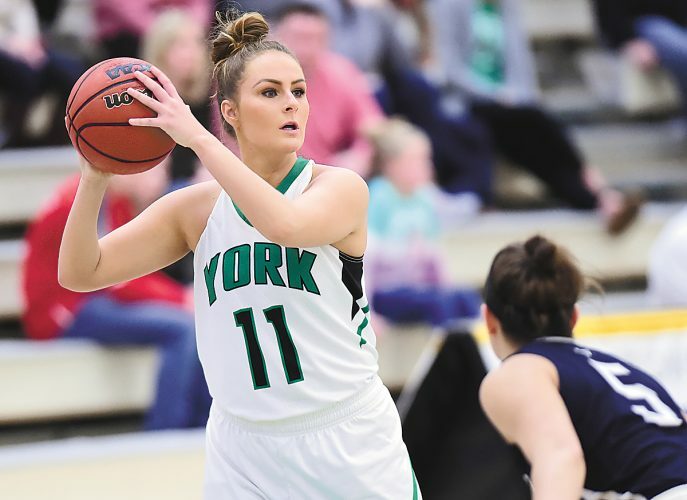 “Our young athletes are finally finding a way to win,” coach Bob Wydock said. Zachary Coder scored big for the Trojans winning the 300 hurdles, javelin and the triple jump. River Terry placed first in both the 200- and 400-meter dash. Unfortunately the girls (0-7) fell to both McConnellsburg 96-40 and to Everett 93-49. Emily Boozel won the pole vault and discus while Carmen Loner scored a first place finish in the 400-meter dash. Mount Union hosts both West Branch and Philipsburg Thursday. 4×800 relay: McConnellsburg, 10:03.8; Mount Union; Everett. 110 hurdles: C.Mellot. E, 17.9; Sam Rice, MU; Zachary Coder, MU. 100 dash: B.Carey, E, 12.0; Hunter Chamberlain, MU; J.Strait, MC. 1,600 run: H.Cessina, E, 5:25.65; Aiden Hollibaugh, MU; J.Truax, E. 400 dash: River Terry, MU, 56.75; J.Strait, MC; E.Dickerson, MC. 4×100 relay: Mount Union, 52.4; McConnellsburg; Everett. 300 hurdles: Zachary Coder, MU, 48.7; B.Smith, E; E.Wesheberger, MC. 800 run: Trevor Skopic, MU, 2:21.65; H.Cessina, E; X.Buterbaugh, MC. 200 dash: Terry, MU, 24.69; E.Dickerson, MC; Chamberlain, MU. 3,200 run: J.Truax, E, 12:03.99; Buterbaugh, MC; Bryce Beatty, MU. 4×400 relay: Mount Union, 4:00.7; McConnellsburg. Javelin: Coder, MU, 134-7; Covert, MC; Clark, E. Long jump: L.Brambley; E, 17-5; B.Smith, E; Parsons, MU. Shot put: J.Clark, E, 38-9; I.Covery, MC; Xavier Wright, MU. High jump: Colt Parsons, MU, 5-7; Terry, MU; Rice, MU. Triple jump: Coder, MU, 32-2.5; B.Lupey, MC; C.Mellott, E. Discus: Covert, MC, 100-7; Clark, E; Wright, MU. Pole vault: Kevin Morehouse, MU, 9-6; B.Smith, E; L.Biambley, E.
4×800 relay: McConnellsburg, 12:07; Everett. 100 hurdles: S.Harnish, MC, 17.9; R.Werschhot, MC; Maraea Hopper, MU. 100 dash: Speigle, MC, 13.3; Robinson, MC; Hauze, E. 1,600 run: Walters, E, 7:11.4; Snyder, MC. 400 dash: Carmen Loner, MU, 1:16.0; Booth, MC; Aliu Jiang, MU. 4×100 relay: McConnellsburg, 55.1; Mount Union. 300 hurdles: Washabaugh, MC, 58.08; Biddle, E; Mills, E. 800 run: Walters, E, 3:08.1; Loner, MU; Kinder, E. 200 dash: Speigle, MC, 27.9; Yokum, E; Robinson, MC. 3,200 run: Snyder, MC, 15:36.77; Mills, E. 4×400 relay: McConnellsburg, 4:49.90; Everett. Javelin: Hall, E, 89-11; Truax, MC; Boozel, MU. Long jump: Harnish, MC, 14-10.5; Yocum, E; Hauze, E. Shot put: Dodson, MC, 35-10; Hoover, MC; Truax, MC. High jump: Yokum, E, 4-10; Hopper, MU; Steel, E. Triple jump: Yokum, E, 28-11; Wenschhot, MC; Hauze, E. Discus: Boozel, MU, 93-0; Truax, MC; Hall, E. Pole vault: Emily Boozel, MU, 7-6; Johnson, E; Toothman, MC. MILLERSBURG — Juniata dominated Millersburg with the boys winning 104-46 and the girls 100-50 in a Tri-Valley League track and field meet on Tuesday. The Indians won 11 events on the boys side with Will Tyson and Garrett Baublitz leading the charge. Tyson placed first in the 110 and 300 hurdles while Baublitz won the 1600 and 3200 meter runs. The girls won all three relay races while Megan Brubaker won both the long and triple jumps. Ashlyn Pannebaker won both the 100 and 200 meter dash events. Juniata swept both the 100 and 200 meter dash as well. 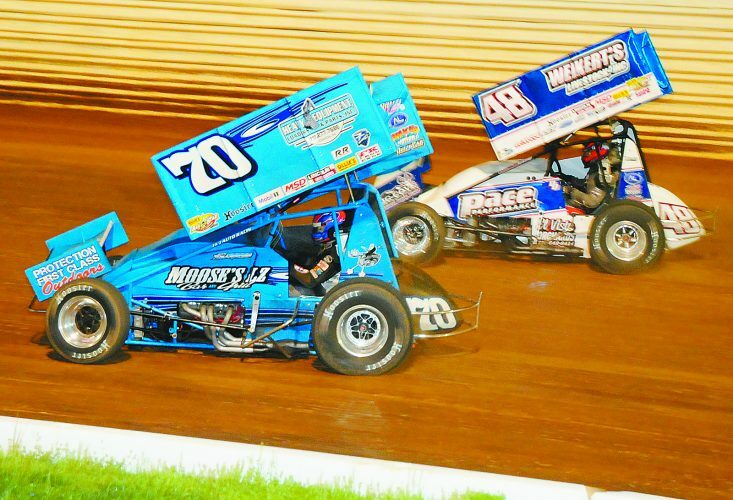 Juniata hosts cross county rival East Juniata April 16. 4×800 relay: Juniata, 9:17.58; Millersburg. 110 hurdles: Will Tyson, J, 17.52; Charlie Barton, J; Theron Barton, J. 100 dash: Jay Zirby, M, 12.1; Carl Fowler, J; London Johnson, M. 1,600 run: Garrett Baublitz, J, 4:50; Clay Yeager, J; Jacob Maorietic, M. 400 dash: Matt Strout, M, 53.5; Jeremiah Parson, J; Dyson Weaver, M. 4×100 relay: Juniata, 46.9; Millersburg. 300 hurdles: Tyson, J, 45.2; T.Barton, J; C.Barton, J. 800 run: Clay Yeager, J, 2:21; Baublitz, J; Noah Stall, M. 200 dash: D.Weaver, M, 25.3; C.Fowler, J; Zirby, M. 3,200 run: Baublitz, J, 10:57; Yeager, J; Mauretic, M. 4×400 relay: Millersburg, 3:51.5; Juniata. Javelin: Walters, J, 125-7; Nathan B. M; London J., M. Long jump: Stout, M, 19-0; Brayden Pannebaker, J; Hunter Smith, M. Shot put: Grant Washinger, M, 38-2.5; Garrett Meifert , J; Barrett Walters, J. High jump: Scott Brosius, J, 5-4; Elliot, J; Pannebaker, J. Triple jump: Stout, M, 38-11; Jon Elliot, J; Pannebaker, J. Discus: Meifert, J, 106-3; Zach Hart, J; Walters, J. Pole vault: Chase Lehman, J, 12-0; Tansen Miller, J; Stuart Dare, J. 4×800 relay: Juniata, 12:18.42; Millersburg. 100 hurdles: Jordan Malton, M, 17.70; Anna Stroup, J; Liseth Montoya, J. 100 dash: Ashlyn Pannebaker, J, 14.19; Nylah Pannebaker, J; Zoe Burns, J. 1,600 run: Ella Stipe, M, 6:42.6; Emily Houtz, J; Sydney Houtz, J. 400 dash: Montoya, J, 1:11.45; Amelia Orr, M; Valorie Fisher, J. 4×100 relay: Juniata, 53.9; Millersburg. 300 hurdles: Courtney Oxearider, M, 52.7; A.Stroup, J; V.Fisher, J. 800 run: S.Houtz, J, 2:47; Chloe Zendt, J; Jess Huffman, M. 200 dash: Ashlyn Pannebaker, J, 29.6; N.Pannebaker, J; Burns, J. 3,200 run: Stipe, M, 17:06.3; E.Houtz, J; Kaylyn Walters, J. 4×400 relay: Juniata, 4:51.1; Millersburg. Javelin: Emma M., M, 88-11; Cathy Pacheco, J; M.Beward, J. Long jump: Megan Brubaker, J, 16-0.5; Jillian Fulkroad, M; Olivia Clark, J. Shot put: M.Piper, M, 31-1.5; Julie Hart, J; Malin Kint, J. High jump: O.Clark, J, 4-8; Fulkroad, M; Jordan Mallon, M. Triple jump: M.Brubaker, J, 34-0; Fulkroad, M; O.Clark, J. Discus: Madi Beward, J, 94-8; J.Hart, J; M.Kint, J. Pole vault: Hannah Cams, M, 7-0; Jasmibne Hockenberry, J; Semeria Malcolm, J.
COVE — East Juniata struggled against Susquenita with the boys losing 107-39 and the girls 109-41 in a Tri-Valley League track and field meet Tuesday. On the boys side the Tigers scored five first place finishes with Tanner Martin won in both the 110 and 300 hurdles. Albert Heister won the 800-meter run and Jonathan Phillips took first in the shot put. For the girls East Juniata came in first in six different events. East Juniata travels to the Tulpehocken Invitational Friday. 4×800 relay: East Juniata, 9:55.2; Susquenita. 110 hurdles: Tanner Martin, EJ, 18.9; A.Carmo, S; Coy Sheaffer, EJ. 100 dash: J.Wilson, S, 11.7; J.Stump, S; J.Garula, S. 1,600 run: M.Singley, S, 5:09.4; Albert Heister, EJ; S.Belle, S. 400 dash: W.Pack, S, 56.2; G.Kitner, S; Caleb Seeger, EJ. 4×100 relay: Susquenita, 46.6; East Juniata. 300 hurdles: T.Martin, EJ, 46.6; C.Sheaffer, EJ; A.Carmo, S. 800 run: A.Heister, EJ, 2:21.1; K.Reed, S; J.Vaccaro, S. 200 dash: J.Stump, S, 23.9; W.Pack, S; C.Bitner, S. 3,200 run: M.Singley, S, 11:29.8; S.Belle, S; J.Vaccaro, S. 4×400 relay: Susquenita, 3:50.8; East Juniata. Javelin: C.McGuire, S, 136-04; M.Miller, S; C.Seeger, EJ. Long jump: J.Garula, S, 19-03.5; G.Magee, S; Riley Hepner, EJ. Shot put: Jonathan Phillips, EJ, 37-10; X.Eckerd, S; MaGuire, S. High jump: J.Wilson, S, 5-8. Triple jump: J.Wilson, S, 39-0; G.Magee, S; R.Hepner, EJ. Discus: J.Homan, S, 122-06; R.Hepner, EJ; X.Eckerd, S. Pole vault: C.Forrer, S, 11-00; D.Forrer, S; J.Holman, S.
4×800 relay: East Juniata, 11:58.3; Susquenita. 100 hurdles: H.Brenny, S, 17.8; E.Harbold, S; S.Schoffstall, S. 100 dash: A.Kauffman, S, 13.5; R.Horting, S; H.Sherman, S. 1,600 run: E.Wert, Ej, 6:33.2; S.McNaughton, S; E.Wimett, S. 400 dash: Kierstyn, Fogle, EJ, 1:05.5; M.Crone, S; M.Blyler, S. 4×100 relay: Susquenita, 53.6; East Juniata. 300 hurdles: H.Brenny, S, 50.9; E.Harbold, S; H.Zettlemoyer, S. 800 run: M.Blyler, S, 2:43.3; Thea Neimond, EJ; K.Frankhauser, S. 200 dash: A.Kauffman, S, 28.0; R.Horting, S; H.Sherman, S. 3,200 run: S.McNaughton, S, 14:41.9; Andrea Baer, EJ; E.Misner, S. 4×400 relay: Susquenita, 4:33.7; East Juniata. Javelin: Clarye Guyer, EJ, 105-02; J.Siefried, S; T.Hunter, S. Long jump: Madison McDonald, EJ, 13-5; Brianna Henry, EJ; A.Walsh, S. Shot put: Alyssa Hibbs, EJ, 29-03.5; M.Bradney, S; K.Hoch, S. High jump: A.Walsh, S, J4-02.0; Ay.Walsh, S; Rebecca Book, EJ. Triple jump: A.Walsh, S, 29-7; Ay.Walsh, S; M.McDonald, EJ. Discus: J.Segfried, S, 95-10; E.Comp, S; K.Hoch, S. Pole vault: G.Anderson, S, 6-0; K.Masser, S; J.Siegfried, S.
MIFFLINTOWN — Juniata recorded five shoutout sets as it went on to shutout Tussey Mountain in boys tennis Tuesday afternoon. George Hazard had the best day for the Indians in No. 3 singles, winning by the score of 6-0, 6-0. “I’m very proud of way our team played each match tonight,” Juniata coach Sheri Landis said. LEWISTOWN — Josh Nichols could claim top honor in Tuesday’s Mid-Penn tennis match, the only set winner for Mifflin County in a 5-0 loss to Mechanicsburg. The Huskies travel to Altoona today. ¯ Chambersburg 7, Mifflin County 6. ¯ Mount Union 16, Williamsburg 1: Patyn Criswell had two RBIs.